Girl Scout cookie hell season has started again. Our troop of 11 girls presold over 700 boxes of cookies. 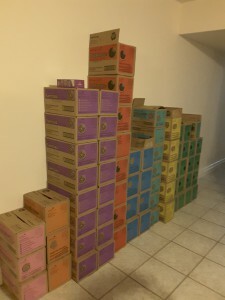 I placed an order for another 400 boxes of cookies for the girls to sell at cookie booths. Which means that Monday night three other moms and I had to go pick up 91 cases of cookies. Now I need to spend the next six weeks getting rid of them. Yesterday was day one of delivering cookies to the people in our building who ordered them. Unfortunately, not everyone remembers ordering. One lady was very insistent that she hadn’t ordered and paid for a box of Thin Mints. She wouldn’t take the box even when we insisted it was hers. So on the plus side, I have a box of Thin Mints to place in my freezer. On the down side, this is why I worry about my safety being dependent on other people in this building (which I discussed here). Because if she can forget that she was expecting a box of delicious Thin Mints, she is likely to forget other equally important things, like blowing out candles. The cookie delivery also increased my other concern that I wrote about in that same post – naked guy. Last night Michael had to go downstairs to get a dolly to help transport all the cookies around. While he was there he saw naked guy, naked guy’s young daughter and THREE cops. The cops were putting the daughter into one of their cop cars and telling her that her mom would be taking care of her now. Naked guy wasn’t arrested, so I’m hoping this is just a custody spat and not something more sinister related to his nakedness. I may need to give the front desk staff the box of Thin Mints the other lady didn’t want, in order to curry favor and get any updates. Cookie season also means my cooking drastically decreases. And what is done will be like 90% crock pot. So I treated the family to one last non crockpot meal. Dijon Lime Chicken. This is another dish I have been making for years and love. The mustard gives a sharp taste but the lime keeps it light. And bonus, aside from one lime, it only needs a few pantry staples. It is also seriously easy to make. 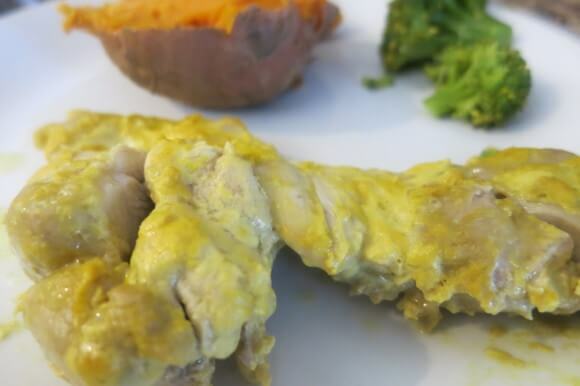 The original recipe calls for mixing the sauce in a bowl and then coating the chicken before putting it into the baking pan. But that’s just one more dirty dish, so I slather it right in the baking pan. Next time I may add some potatoes and carrots to the pan as well. Then complete the meal with some more citrus, in the form of a Girl Scout Savannah Smiles. 🙂 If you need some cookies for your after dinner treat, let me know. Help me reclaim my entry way! Place chicken in baking pan. 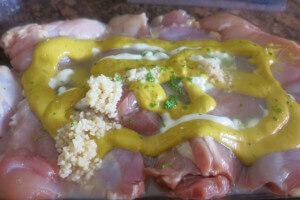 Add remaining ingredients to pan and mix together to coat all chicken. Bake for 40 minutes. Enjoy!